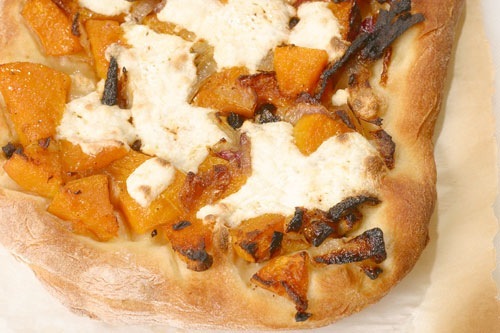 I know what you’re thinking, butternut squash on pizza??? We were skeptical as well, but the pictures accompanying the recipe looked too good to pass up. We are hopeful that our own photos will inspire you to try this recipe, as well! Verdict: the sweetness of the butternut squash and the dryness of the ricotta cheese were a perfect compliment. To find the perfect winter squash, look for one that feels heavy for its size and that is blemish-free. Store squash in a cold, dark dry place for up to 1 month. To peel squash, cut it in half lengthwise, place it cut-side down and run a peeler along the surface. The recipe calls for store bought pizza dough. Dough is always better if you make it fresh yourself, which we did. Of course. If you want to make your own dough too, use the dough recipe from the Thin Crust Pizza article. 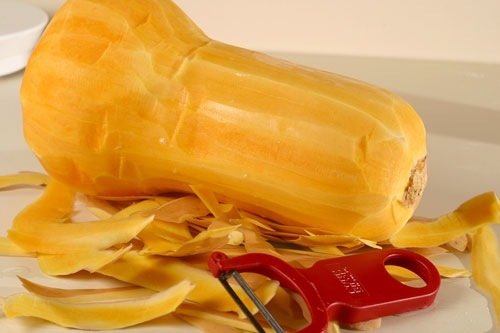 Cut the squash into 1/2-inch-thick slices, then cut each slice into 1-inch chunks. Place the squash and onion on a baking sheet. Drizzle with the olive oil, season with the salt and pepper, and toss. Roast until tender, about 20 minutes. Transfer to a plate. Increase oven temperature to 450 F.
Roll the dough out Â¼ inch thick. Clean the baking sheet and sprinkle it with the cornmeal. Place the dough on top. 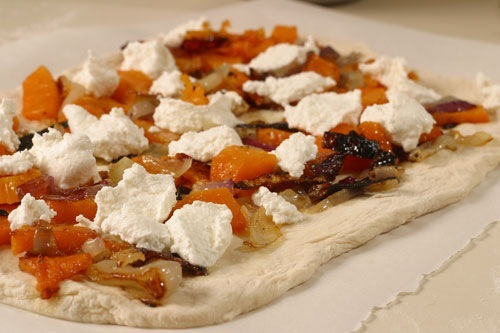 Scatter the squash and onion mixture over the dough, sprinkle with the thyme, and add dollops of the ricotta. Bake until golden, about 25 minutes. Slice into wedges. Another good thing I love to add to mine is dried cranberries. I use them instead of the onion and it makes an amazing pizza. That sounds awesome. I love butternut squash, especially when it gets crispy from the oven. Ricotta was a genius idea for the cheese. So many people don’t like ricotta but no matter what kind of pizza I get/make, I love putting dollops of ricotta on top and toasting it in the oven for a few minuntes. I just made a pizza pie a few weeks back, but I used a few more ingredients: BBQ Chicken & Veggie Pizza. It came out great and I piled ricotta on top as well. I usually use fat-free ricotta when I can find it because I can hardly taste a difference and it’s a great source of protein that replaces meat (if you’re looking to do that). I’m writing this recipe down, thanks! Gorgeous! I love the ricotta idea. That sounds like some kinda good – always looking for new ways to enjoy butternut love!